Designed with cottage appeal, this writing desk will definitely become an accent among your decor. The two deep drawers are a feature of this desk and are accessible from the front of the desk with sleek silver handles. Combining a sleek charcoal black finish with contemporary styled legs creates a blend of whimsical charm and modern chic style. The desk is finished on all four sides, making it look beautiful as a center piece of furniture. Add this delightful writing desk to your home for not only convenience but also class. This slim design offers 2 drawers for convenient storage and durable hardwood, and is perfect in any setting. The practical size and function works well anywhere, whether it be the living room or a bedroom. This desk also has a spacious tabletop. Easy-to-follow, step-by-step instructions are also included. This ready to assemble furniture saves you the cost of factory assembly. In addition to saving you money, assembly of this desk is easy and requires only the usage of everyday tools, found in any household. Dimensions 47" x 23" x 30"
CARB Certified. ProHT desks meet the CARB standard and own the CARB Certification. Compare to the other poor quality desks without CARB, the ProHT desk is made to be the highest quality and will be more friendly to the environment, protecting you from exposure to toxic air contaminants, ensure to provide a healthy life for you and your family! The ProHT Contemporary Office Desk with Two Drawers comes with a crisp, sleek black finish. 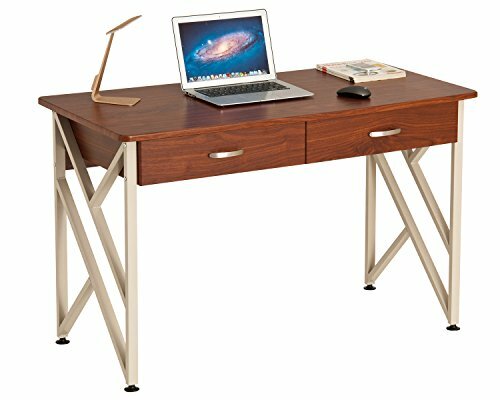 The desk has a sleek modern design on the legs of the desk. The desk is very sturdy and can hold computers, printers, and more despite it's small compact size. The simple design of this desk is a stylish contemporary design that is suitable for any setting, whether it be an office or home. With two drawers for the desk, allowing more efficiency in storage. All necessary tools and step-by-step instructions to assemble the desk are included.